NZ shearer Nathan Stratford. Picture – Shearing Sports NZ. NEW ZEALAND’S shearing team of Southlander Nathan Stratford and Wairarapa farmer David Buick have maintained their country’s unbeaten record against Wales at home at Marton in the opening match of the CP Wool Series at the weekend. The pair beat the understrength Welsh team of Lloyd Rees and Aled Jones by more than 28 points at the start of a four-test series in which the Kiwis are warm favourites for a clean sweep, bouncing back from a 3-1 series loss in Wales last July. The latest win came at the Rangitikei Shearing Sports on Saturday, when world championship hopefuls Rowland Smith, of Hastings, and wool handler Joel Henare, of Gisborne, won the major open finals. The Kiwi pair reinforced their dominance of shearing and wool handling ahead of their bids for selection in the New Zealand team for this year’s world event in Le Dorat, Central France, in July. Smith and Henare were able to celebrate back-to-back wins after the weekend. Smith’s win in the Open shearing finals at the Dannevirke A and P Show on Friday and at Marton on Saturday repeated similar efforts at Wairoa and Levin a fortnight earlier, and Taihape and Rotorua last week. 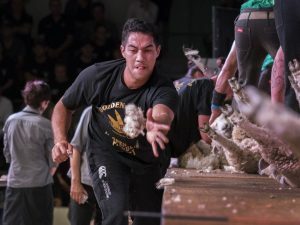 It gave him six wins in six events in 15 days, starting the new year in which his defences of the Golden Shears and New Zealand championships titles will determine the selection of the two machine shearers to go to France. Reigning world champion wool handler Henare also won at Dannevirke and Marton on Friday and Saturday, and will be out to claim a shot at defending the big title when a selection series final is held at the Golden Shears in Masterton next month. First CP Wool Test (20 sheep): New Zealand 125.812pts (Nathan Stratford 16min 2.4sec, 62.058pts; David Buick 15min 6.32sec, 63.754pts) beat Wales 154.066pts (Lloyd Rees 15min 23.4sec, 72.358pts; Aled Jones 17min 15.4sec, 76.708pts). 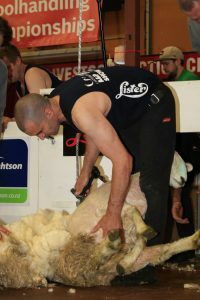 The second test will be at the Otago Shears in Balclutha on Friday. Open final (20 sheep): Rowland Smith (Hastings) 17min 3.06sec, 59.553pts, 1; Cam Ferguson (Waipawa) 17min 5sec, 62.55pts, 2; David Buick (Pongaroa) 18min 5.87sec, 63.494pts, 3; Nathan Stratford (Invercargill) 19min 4sec, 64.802pts, 4; Murray Henderson (Halcombe) 18min 37.18sec, 65.459pts, 5; Gavin Mutch (Scotland/Whangamomona) 18min 37.29sec, 65.615pts, 6. Wool handling — Open final: Joel Henare (Gisborne) 74.43pts, 1; Keryn Herbert (Te Kuiti) 77.72pts, 2; Brittany Tibble (Gisborne) 94.59pts, 4; Monica Potae (Milton) 109.66pts, 5; Eramiho Neho (Dannevirke) 122.72pts, 6. Dannevirke A and P Show shearing and wool handling championships on Friday, February 1, 2019 – Shearing — Open final (20 sheep): Rowland Smith (Hastings) 15min 38sec, 53.73pts, 1; Nathan Stratford (Invercargill) 17min 27sec, 62.07pts, 2; Hemi Braddick (Eketahuna) 16mins, 64.06pts, 3; Darren Alexander (Whangamomona/Havelock North) 18min 23sec, 68.65pts, 4. Wool handling — Open final: Joel Henare (Gisborne) 32.53pts, 1; Sheree Alabaster (Taihape) 40.59pts, 2; Eramiha Neho (Dannevirke) 41.37pts, 3.